It's only been the past year or so that I've been watching TFN regularly. By "regularly" I mean that whenever you turn on any of the tv's in my house, it will inevitably be tuned to that channel. Some of my favorites are Paula Deen(read her book, it's very inspiring! ), Bobby Flay, Tyler Florence, Guy Fieri.. 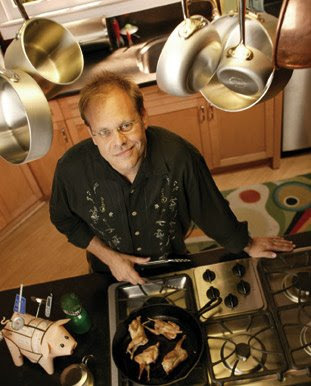 I like most of the FN chefs, but lately I've developed a special love for the one and only Alton Brown. When I saw Good Eats for the first time, I thought Alton was just annoying. But then I started watching the show for the content rather than his over-use of the "ah" phrase and I realized that Good Eats is actually the perfect show for me. I am one of those people that needs to know how things work. Alton not only shows you how to cook things the right way, he shows you WHY you need to cook things that way. I wish I had known 20 years ago that I love the science of things so much. I would've paid a lot more attention in school. I also probably would've been a nutrition major in college. Last night I saw an episode about popovers and it was fascinating. I love learning about how foods work with each other. A lot of this comes from gluten-intolerance and trying to figure out how gluten works so that one day I might be able to come up with the perfect gluten-free recipes for breads, cakes, pies, etc. Can't wait for kickboxing tonight! I will say, though, that he has gotten more annoying than he used to be.